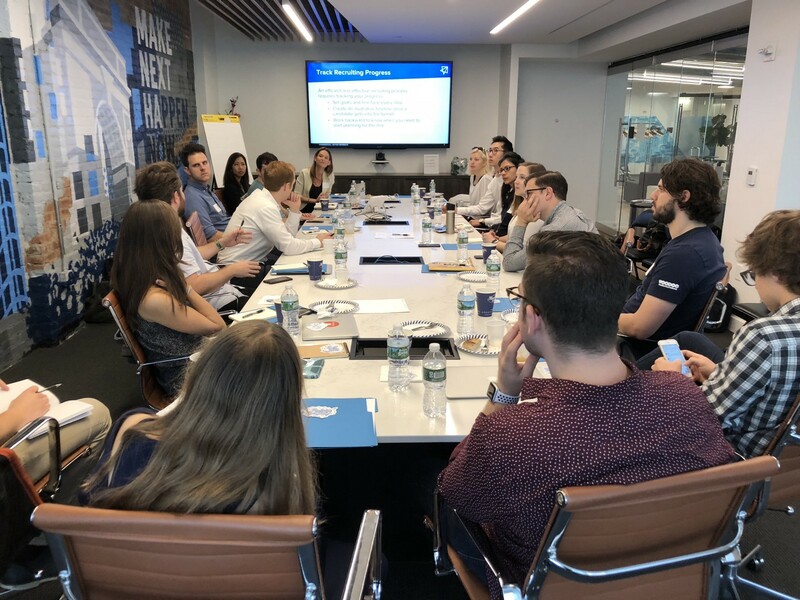 Last week, we hosted our very first portfolio-only Hiring Bootcamp in NYC, led by NextView’s talent advisor Kristen Caldwell. We launched the Hiring Bootcamp to equip portfolio founders and hiring managers with the best practices around building a hiring machine, so they can maximize their chances of getting the best talent into the door efficiently. The quest for building such hiring machine is universal across companies at various stages. Keeping that in mind, we designed the program in such way that later-stage portfolio companies such as Dia&Co and MealPal could gain insights alongside younger ones such as Voodoo Manufacturing, ExecThread, and Virgent Realty. It was a jam-packed day with content covering topics from branding to diversity recruiting to the interview and offer process. Without giving away the entirety of the discussion, below are some of the biggest take-aways from participants around the table. Conversion. To get one hire for a given role, how many phone screens, interviews and offer extends are needed? Timeline. How long would it take from opening the role to get someone in this seat, starting to make an impact to the business? B2C companies usually have a strong grasp of their marketing funnel (and B2B companies with their sales funnel), and the best ones are relentless on constant fine-tuning and optimization. Treating your talent acquisition with the same level of rigor as your customer acquisition will maximize your chances at landing the talent you need to scale the business. The best candidates aren’t looking. Just like you can’t expect “if you build it they will come,” it’s naïve to assume that “if you post the role they will apply.” To hire the best, you need to fill the top-of-the-funnel with the best candidates that fit the profile you’re looking for — almost all of them will come from proactive outbound sourcing. LinkedIn will become your best friend. To break out from the noise, get creative with your messaging and highlight why your brand is special. Iterate on your approaches here to identify what resonates best with candidates and improves conversion. Apply the learning back to your long-term effort of elevating your brand. Interviewing is a critical step of evaluating talent, but it is extremely time-consuming — it takes time away from you (and your team) from doing the actual work. Calibrating all the interviewers on the profile of a role and defining each interviewer’s focus area is the best way to ensure an efficient evaluation process (and a good candidate experience). It’s not enough to have a game plan if you can’t move fast. The best candidates have options, and time is of the essence if you want to have a shot at attracting the best talent. It’s critical to establish the discipline and urgency to keep the process moving — e.g. debrief within 24 hours of the interview (and walk out with next steps! ), do not let take-home exercise become the bottleneck, and prioritize interview scheduling over other seemingly important meetings on your calendar. Build a diverse candidate pool. Your candidate pool reflects your final recruiting outcome, so it takes deliberate sourcing effort and proactive outreach to bring the candidates you want to see into your recruiting funnel. Eliminate bias in job descriptions. This might seem trivial, but what’s in the JD actually matters (yes, people read them!). Use neutral job titles and pronounces, call out commitment to equality and diversity, and highlight family-friendly benefits. Eliminate bias during interview process. Start with a diverse interview team — people look to who’s already there to gauge the company’s culture. Interview with structured questions related to the job and focus on evidence (not emotions or derived per) during the debrief to evaluate candidates to ensure objective assessment. The Hiring Bootcamp is something we plan to continue offering as part of our Platform resources for portfolio companies. If you’re working on a startup that could benefit from this types of programs to supercharge your ability to scale, don’t hesitate to reach out to any of us on the NextView team.